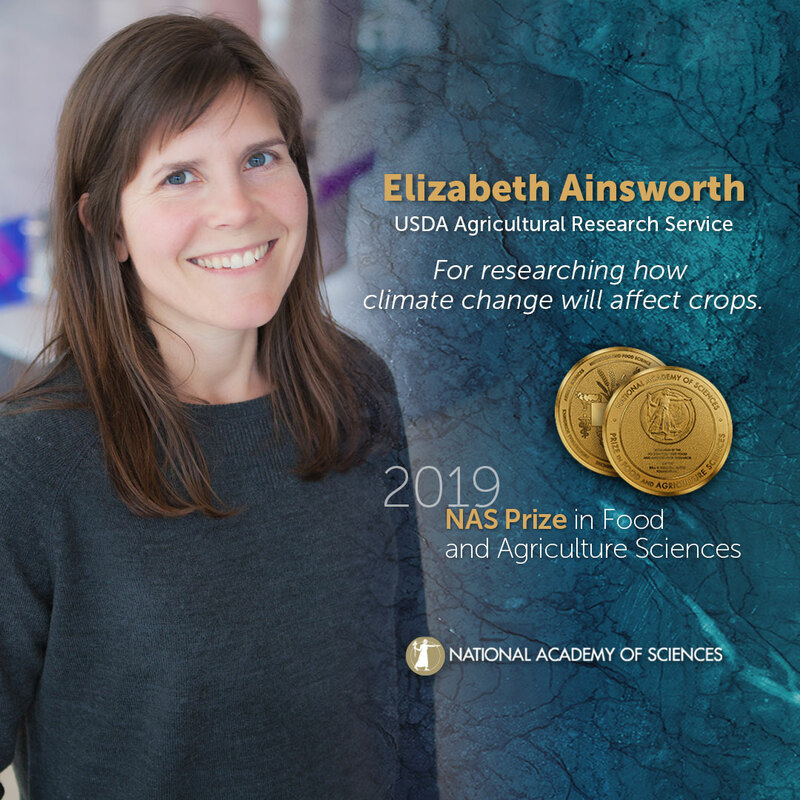 Elizabeth Ainsworth, USDA Agricultural Research Service, will receive the 2019 NAS Prize in Food and Agriculture Sciences. Ainsworth was among the first to use functional genomic and metabolomics approaches to understanding mechanisms of response to global change, and has recently used quantitative genetic approaches to dissect plant responses to these changes. In addition to her research itself, Ainsworth is also recognized for her tireless advocacy for science, both as a science ambassador and as a role model for the next generation of scientists. She frequently speaks to the media about climate change, and she started the Pollen Power Camp to encourage junior high-school girls to consider science careers. As an adjunct professor, Ainsworth has also mentored countless university students and postdoctoral researchers, helping to ensure that a new wave of professional biologists will follow her lead for many years to come. The NAS Prize in Food and Agriculture Sciences recognizes research by a mid-career scientist (defined as up to 20 years since completion of PhD) at a U.S. institution who has made an extraordinary contribution to agriculture or to the understanding of the biology of a species fundamentally important to agriculture or food production. The prize is endowed through generous gifts from the Foundation for Food and Agriculture Research (FFAR) and the Bill & Melinda Gates Foundation. The NAS Prize in Food and Agriculture Sciences is presented with a medal and a $100,000 prize. Please use the following sample social media posts and other materials to congratulate Elizabeth Ainsworth.